Debut is sixteen years old. I'll let that hang for a bit. Sixteen years since I spent a day in Portsmouth with three friends and came back with three albums. I have no idea what the other two were now. But I remember that one of them was Debut. Björk is one of the strangest ever pop stars. She released her first record in 1977 and was something of a child star in her native Iceland. She later gained further critical acclaim in the band the The Sugarcubes but it was in 1993 after the band split that she hit the big time. Every so often an album comes out that captures a moment and Debut did that completely. It must go down as one of the oddest overnight success stories of all time. The music press went crazy for her. The NME clearly saw her as one of their own and as the singles rolled out so the momentum built. It was just everywhere. Personally the album is incredibly evocative of the time. It is one of those albums that sound tracked my life to the point where it's quite hard to listen to. Her voice is so fragile, almost child like, yet full of strength. Her Icelandic accent bringing a weird otherworldly sound to songs that are little more than a beat. The album is full of stand out moments but Venus as a Boy is probably the best example of Björk nailing her style. Romantic, sweet and naieve. Timeless and Beautiful. That she was utterly bonkers also helped to build her reputation. Björk was always good for a quote or for punching a journalist at an airport. She didn't really seem to care, but slowly but surely she drifted away from fame as she matured. Her albums have sold less and less well as she has moved away from the mainstream. She's still a relevant artist, she just doesn't push as many punters buttons. Post, the album that followed Debut has It's Oh So Quiet on it and still sold a fair few copies, but the last I purchased was Vespertine in 2001, and there's been a further two albums since then. She's just got a bit too avant garde for me. 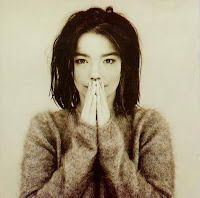 Björk is an artist in the true sense of the word. Her work is instantaneously recognisable as hers, her voice as an instrument. But what works so well on Debut is the marriage between her arty leanings and pure pop. There is a dance ethic to it that just works so well, with clever production from Nellee Hooper. He rained in some of the weirder musical stuff that would follow, letting Björk's strange voice be the star of the show. She's an Icon because her face adorned my tiny student bedroom. She lit up a grey North London house with an album full of charm and beauty. Weird, pretty, great voice, and totally unique. Tonight's post is dedicated to AT (@maverick99sback).